The gemstone representing the positive powers of Jupiter in Vedic Astrology and Vedic Gemology is the Yellow Sapphire also known widely as Pushparagam and Pukhraj. Jupiter is a natural benefic planet and represents good fate and fortune, divine guidance, divine grace, education, power of speech and knowledge. This planet also represents continuation of the family tree, power of mantras, and guidance from Guru or preceptors, fame and public acclaim. Jupiter is also known as Guru and Brihaspati. It is a well known fact that if a female individual is having obstacles in getting married, she should wear a properly consecrated Yellow Sapphire gemstone. This remedy will remove the obstacles in getting married. We will analyze ascendant wise the combinations in which Yellow Sapphire gemstone would be favorable. Jupiter becomes a very auspicious and important planet for this ascendant ruled by Mars. In this ascendant, Jupiter becomes the Lord of the 9th trine house of fate and fortune and the 12th house of expenditure. The 9th house is one of the most auspicious houses in one's horoscope and if an individual wears Yellow Sapphire gemstone much gains can be expected. Jupiter is also the friend of the ascendant Lord-Mars. The Aries ascendant individuals in whose charts Jupiter is placed in the 1st, 5th, 9th, 4th houses should wear Yellow Sapphire birthstone throughout life. Individuals under the major period of Jupiter can wear Yellow Sapphire gem stone in any house expect for the position of Jupiter in the 10th house where it gets debilitated. Jupiter is not an important planet for this ascendant. Firstly, it becomes the enemy of the ascendant Lord-Venus. Secondly it owns the 8th house of losses and accidents. In this ascendant Jupiter owns the 8th house of losses and accidents and the 11th house of profits. Individuals should consider wearing a Yellow Sapphire gemstone only in the major period or sub period of Jupiter and only if they are not wearing Diamond or Emerald. Individuals in whose chart, Jupiter is posited in the 11th house, 3rd house, 4th house can wear Yellow Sapphire gemstone in Jupiter periods subject to the conditions stated above. Jupiter loses much of its potency in this ascendant ruled by Mercury. In this ascendant Jupiter becomes the Lord of two quadrant houses- the 7th house of marriage and relationships and the 10th house of career and profession. When a planet owns two quadrant houses it suffers from the Kendradhipati Dosha or weak directional influence. Individuals should consider wearing a Yellow Sapphire gem stone only when the Jupiter periods are operating. Individuals in whose horoscope, Jupiter is posited in the 2nd, 7th or 10th house can wear Yellow Sapphire gem stone when the Jupiter major period or sub periods are operating. Jupiter is a Key planet for Cancer ascendant and if well placed can bring a lot of gain when its periods are operating. In this ascendant, Jupiter becomes the Lord of the 6th house of diseases etc but the most important point which goes in favour of Jupiter is that it becomes the Lord of the 9th trine house of fate and fortune. the 9th house also known as the Dharma Stahana is one of the most auspicious houses in the birth chart. Those individuals in whose charts, Jupiter is posited in the 1st house, 2nd house, 5th house, 9th house, 10th house and 11th house can wear a Yellow Sapphire birth stone for life. Jupiter in these positions will create very good opportunities for the individual. Jupiter becomes an auspicious planet for the Leo Ascendant. It becomes the Lord of the 5th trine house of education, higher knowledge, sudden fame and the 8th house of inheritance and legacy. Those individuals in whose charts- Jupiter is posited in the 1st house, 4th house, 5th house, 9th house can wear Yellow Sapphire birthstones for life. Jupiter in the 10th house, 11th house can be given strength by wearing Yellow Sapphire stone when its planetary periods are in operation. Jupiter loses much of its potency in this ascendant ruled by Mercury. In this ascendant Jupiter becomes the Lord of two quadrant houses- the 4th quadrant house of assets, mother and pleasures and the 7th house of marriage and partnerships. When a planet owns two quadrant houses it suffers from the Kendradhipati Dosha or weak directional influence. Individuals should consider wearing a Yellow Sapphire gemstone only when the Jupiter periods are operating. Individuals in whose horoscope, Jupiter is posited in the 4th, 7th or 11th house can wear Yellow Sapphire stone when the Jupiter major period or sub periods are operating. Jupiter becomes a problem creating planet in this ascendant unless it is posited in a benefic house and in a benefic sign. In this ascendant Jupiter becomes the lord of the 3rd house of courage, initiative and siblings and the 6th house of diseases, debts and enemies. Secondly, it is the enemy of the ascendant Lord-Venus. Yellow Sapphire gem stone should be considered only when Jupiter periods are operating. Those individuals in whose charts- Jupiter is posited in the 3rd house, 6th house, 9th house, 10th house, 11th house can wear Yellow Sapphire gem in Jupiter periods provided they are not already wearing a Diamond. Jupiter becomes the planet of education and the planet of wealth in this ascendant. In this ascendant ruled by Mars, Jupiter becomes the Lord of the 2nd house of wealth and the 5th trine house of education, higher knowledge, and sudden fame. Those individuals in whose horoscopes Jupiter is posited in 1st, 2nd, 5th, 9th, and 10th house can wear Yellow Sapphire gemstones for life. Jupiter posited in the 4th house, 7th house and 11th house will also prove auspicious in its period. In such a planetary period, individuals can give strength to Jupiter by wearing Yellow Sapphire. Jupiter is a Key planet for it becomes the lord of the ascendant. In this ascendant- Jupiter becomes the Lord of the 1st house of self and the 4th house of mother, pleasures, assets etc. Those individuals in whose charts, Jupiter is posited in the 1st house, 4th house, 5th house, 9th house can wear Yellow Sapphire gemstone for life. Jupiter posited in the 10th house and 11th house will also prove auspicious in its period. In such a planetary period, individuals can give strength to Jupiter by wearing Yellow Sapphire. This ascendant is ruled by the Karmic planet- Saturn. In this ascendant- Jupiter becomes the Lord of the 3rd house of siblings, courage and initiatives and the 12th house of expenditure and losses. Yellow Sapphire gemstone should be considered only in Jupiter planetary periods. Those individuals in whose horoscopes, Jupiter is posited in 3rd, 4th, 7th and 11th houses can give strength to Jupiter by wearing Yellow Sapphire gem stone only when the Jupiter planetary periods are operating. This ascendant is also ruled by Saturn and Jupiter is a block creating planet in this ascendant. In this ascendant, Jupiter becomes the Lord of the 2nd house of wealth and death and the 11th house of profits. Individuals should consider wearing Yellow Sapphire gemstone only when Jupiter periods are operating. Those individuals in whose charts, Jupiter is posited in the 2nd house, 10th house and 11th house can wear Yellow Sapphire stone during the major period or sub period of Jupiter. Jupiter is a Key planet for it becomes the lord of the ascendant and the 10th quadrant house of career and profession. Those individuals in whose charts, Jupiter is placed in 1st house, 5th house, 9th house or 10th house can wear Yellow Sapphire gemstone for life. Individuals in whose charts, Jupiter is posited in 2nd house, 3rd house, 4th house or 7th house can give strength to Jupiter by wearing Yellow Sapphire gem stone in the major period or sub period of Jupiter. When to Wear Yellow Sapphire? One should always consecrate a gemstone ring or pendant and wear it in the most potent time frame selected according to Electional astrology. 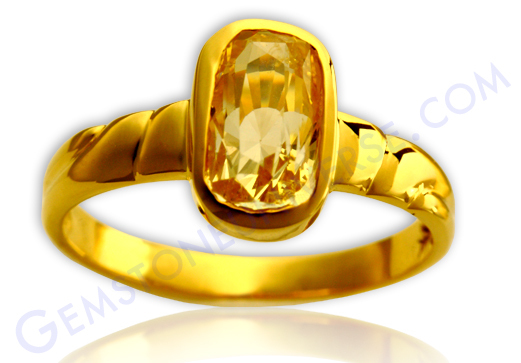 The Yellow Sapphire gem stones should be set in Gold and be worn in the index finger. It should be worn on a Thursday in the constellation of Pushya. If this combination is not possible at the time required and it is important to wear the Yellow Sapphire gemstone then wear it in any Shukla Paksha (Waxing Moon Period) in the hora of Jupiter. Caution: One should not wear Diamond, Blue Sapphire, Hessonite and Emerald along with the Yellow Sapphire gem stone unless specifically recommended by an expert astrologer.